Conventional foods these days are depleted in essential vitamins, minerals and enzymes. Wheatgrass, on the other hand , provides an excellent balance of nutrients vital to good health and well-being. Wheatgrass has varying amounts of protein, minerals and vitamins. Only Sweetwheat is 47% protein. And because it contains chlorophyll, you can use it as part of a detoxing programme to help cleanse the blood and eliminate toxins. A very versatile superfood which works generally on two levels. Firstly as a tonic, a pick you up when your energy levels are flagging. And secondly, as a superfood which, when taken every day, will help nourish and restore your body's natural balance and well-being. "Wheatgrass is a truly miraculous food. It is crammed full of vitamins, minerals, and enzymes, and is capable of supplying all the nutrition your body needs to restore itself to glowing health. "It was during the war torn years of World War I that I first learned about the remarkable healing properties of grasses, especially wheatgrass. My grandmother, a local healer in the European village where I grew up, used grasses to heal the wounded and sick soldiers. About 30 years ago I began my own experimentation with wheatgrass, first on my pets, and then on my tired and aging body. "After eating as an average American most of my adult life I was sickly, weak and gray-haired at fifty years of age. In a few short weeks of chewing and juicing the young blades of wheatgrass and eating the Hippocrates Diet, a festering case of colitis I had disappeared, never to bother me again. My energy level soared, and I felt well again. A few years later my hair color returned to its natural brown again. It was at this point when I realized that wheatgrass was a powerful rejuvenator and invigorator of the body." Health Elements Freeze Dried Organic Wheatgrass Juice Crystals, preserving all the nutrients and enzymes for everyday vitality and well-being, without the hassle of growing, harvesting and juicing. 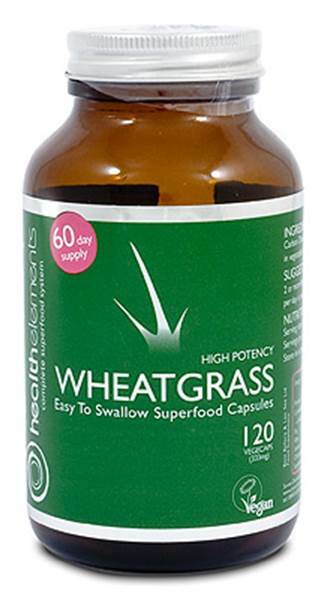 Health Elements Wheatgrass Juice crystals dissolve instantly in water to make an energising quick-acting tonic. This super-store of vitamins, minerals and enzymes is also rich in chlorophyll the natural cleansing agent and an excellent source of easily digestible vegetable protein. The 60 and 180 vegecaps are not certified organic but contain the same 100% pure wheatgrass. Rich in chlorophyll, the natural cleansing agent. An excellent source of easily digestible vegetable protein. Other proteins, such as meat need greater amounts of energy to digest. 100 % Organic freeze-dried wheatgrass juice crystals - preserving all the nutrients and enzymes. No fillers, binders, artificial colours or sweeteners. Grown in a controlled greenhouse environment using organic soil. Harvested at 7-10 days old the point of perfection. A quick ready in an instant solution no fuss, no mess, no juicing. A quick acting tonic and every day supplement. Zinc essential of skin, the immune system, the prostate and eyes. Calcium for strong bones and teeth, and helping restore your bloods pH balance. Sweet Wheat contains trace elements to ensure calcium is properly absorbed. Magnesium for good muscle function and bowel health. Sweat Wheat has a particularly well-balanced calcium magnesium ratio. Vitamin A as betacarotene, essential for good eyesight, reproductive functions, growth and development. Vitamin C protecting against the free radical damage that can lead to degenerative illness. B Vitamins the B vitamins in Sweet Wheat are far more easily assimilated than typical B supplements.